Charles' father was a count and his mother a member of the powerful Medici family. His early dedication to the Church, at age twelve, might have had as much to do with family political considerations as with holiness. Nevertheless, Charles became one of the major forces in bringing about the reforms which took place in the Church in sixteenth century. 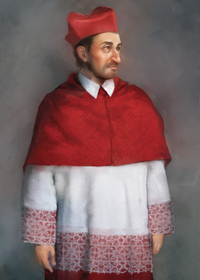 Receiving a doctorate in civil and canon law in 1559, Charles was named a cardinal and administrator of the diocese of Milan when he was twenty-one, shortly after his mother’s brother became Pope Pius IV. It would be several years before he would take up residence in his see however. The pope assigned Charles as his Secretary of State and gave him many other duties in Rome. Charles was responsible for reconvening the Council of Trent in 1562. This assembly, called originally to institute reforms within the Church to counter the Protestant Reformation, had recessed ten years earlier without completing its work. Charles played a major role in this council, keeping it together when dissent threatened to dissolve it and ensuring that the reforms were finally approved by the bishops. When the council was over, Charles was given the task of preparing a Catechism and revising the other liturgical books which the council deemed in need of reform. When his father died during the council, Charles legally became the head of the household. Although he had been a cardinal, Charles had never been ordained. Thus, it was assumed by family members that he would leave his position in the Church to take up his familial duties and to marry. But Charles resigned his position as head of the family in favor of an uncle and sought ordination as a priest. This occurred in 1563, and two months later he was made a bishop. Charles’ uncle, Pope Pius IV, died in 1565 and the new pope, Pius V, allowed Charles to leave Rome and go to his diocese in Milan which was in a deplorable state, having been without a resident bishop for eighty years. Among his first acts was to call a provincial council and establish rules implementing the Council of Trent decrees in the diocese. These reforms brought about discipline and training for the clergy and instituted changes in the administration of the sacraments. A strong believer in education at all levels, Charles opened three seminaries for priests during his episcopacy, and established Sunday school as a teaching implement for children. Charles was noted for his charity. He gave most of his money to the poor and lived a very austere life. When a famine struck Milan in 1570, Charles obtained food supplies from several sources and fed 3,000 people daily for several months. Later, in 1576, a plague struck the city. While many in the civil government and nobility fled Milan, Charles threw himself wholeheartedly into the care of the sick and the dying. The saint expended all of his personal resources and went heavily into debt to purchase food for his people and arrange its delivery. Besides organizing volunteer squads and arranging other forms of relief, the bishop personally ministered to the dying and aided those in need. On the evening of 3 November, 1584, Charles Borromeo died at the still young age of forty-six. A strong devotion to the saint sprang up almost immediately in Milan and he was canonized by Pope Paul V in 1610. He is the patron saint of seminarians and catechists. Charles' message today: This saint provides another example of a wealthy and powerful person who gained salvation by the proper use of his talents. Unlike the rich young man noted in Mark’s Gospel (Mk 10) who could not give up his worldly possessions to follow Jesus, Charles used his talent and possessions to look after his people. Have you become too attached to your worldly possessions? To your position of power?